Frank Muller’s father immigrated from Switzerland in 1967 to start a dairy farm in San Jose. The family later moved to Yolo County, California to focus on row crops. After Frank and his two brothers, Louie and Tom graduated from college, they moved back to Woodland, California to work on the farm. Today in its 49th year of production, the farm employs over 100 people, and Frank focuses mainly on the business aspects of the operation. Frank and Tom’s sons have also returned to the farm as the third generation of farmers and have helped introduce new technology and social media for the farm. 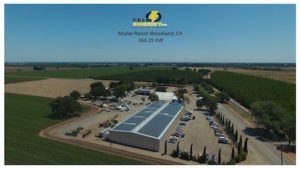 Muller Ranch covers several thousand acres and includes a wide variety of crops, such as processing tomatoes, peppers, garlic, grapes, sunflowers, olives, walnuts, wheat, and almonds. Several hundred acres are certified organic, including some acreage dedicated to organic processing tomatoes, coriander, and white taco corn. Muller Ranch is known for its use of sustainable practices such as crop rotation, minimum tillage, cover cropping, and compost application. As a result of these notable efforts, Muller Ranch has been able to expand to offer other services like farm management, consulting, bee pollination, and habitat restoration. Muller Ranch was first recognized for its sustainable farming practices about 15 years ago when Frank and his partners were approached by Unilever to create a sustainable model for processing tomatoes. The Unilever contract proved to Frank that good stewardship practices have market value, which encouraged him to strive for make continuous improvements. The Ranch’s management practices have changed over time in response to varying factors like weather, pests, market demand, and technology. Frank is particularly interested in good management practices, especially related to energy and water conservation, soil health, and productivity. Frank believes that sustainability means minimizing the use of resources and only adding inputs for a specific reason. 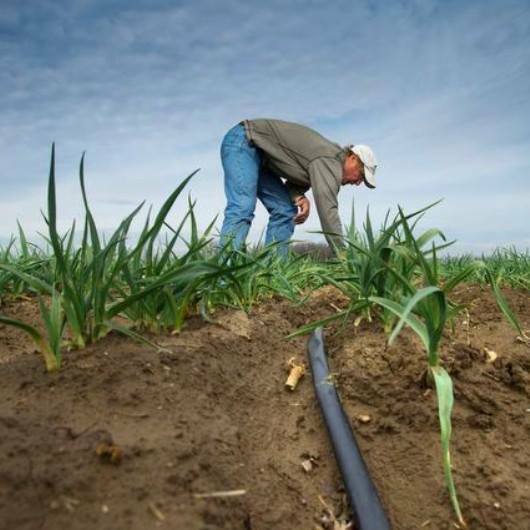 He notes that one of the most important inputs to increase sustainability on the farm has been technology, particularly GPS, which has allowed Muller Ranch to install subsurface drip irrigation more precisely. With regards to energy conservation, the farm is also working on three big solar installations that will power the irrigation systems. In addition to solar, Muller Ranch has recently transitioned to a whole new fleet of tier IV (low emission) tractors. Along with their energy and water conservation, Muller Ranch is committed to maintaining soil health. Soil sensors have been placed in select fields and facilitates necessary management decision-making for irrigation, as well as nitrogen application. Frank notes that soil sensors are expensive, and that it is important to properly budget for all soil improvement projects, including cover crops, and equipment. At Muller Ranch, compost is an important component of maintaining soil health on the farm. According to Frank, using compost has greatly aided in building soil structure and potassium content. His chosen compost consists of green waste sourced from a nearby waste-processing facility, and chicken litter. GPS technology has facilitated many conservation gains. Frank’s drip GPS and monitoring system has resulted in a 40 percent reduction in water use on tomatoes alone. By using GPS on tractors, the ranch’s field operations have decreased by 15 percent, reducing labor costs and greenhouse gas emissions. As for nutrients, Frank explains that by just monitoring and only applying the appropriate amount, Muller Ranch has reduced nitrogen use by 80 percent with no decrease in yield. In addition to the farm’s environmental and economic sustainability, Frank is very proud of the farm’s commitment to social equity. The farm offers benefits including medical insurance and bonuses to its employees. For his efforts, Frank has received Agriculturalist of the Year awards from both Yolo County and UC Davis. He credits the positive publicity generated by the Unilever contract with elevating Muller Ranch as a model for sustainability.